EspañolVarious Latin-American governments have recently taken steps to regulate the use of bitcoin and other cryptocurrencies. On July 24, Ecuador’s parliament, through a majority vote, approved the Monetary and Financial Code, which in addition to creating a top-down, state-run digital currency, also prohibits all unofficial digital or physical currencies. A group of young bitcoin users known as BitcoinsEcuador on social media networks decided recently to look for new business opportunities with bitcoin. They purchased an ATM on the internet for US$5,000 and began an exchange service where people could cash in their virtual currency for dollars. However, once it became clear that the passage of the Monetary Code was only a matter of time, the group of entrepreneurs grew concerned about how the legality of their business may be threatened. On July 3, they decided to ask Ecuadorian authorities directly how they should proceed. 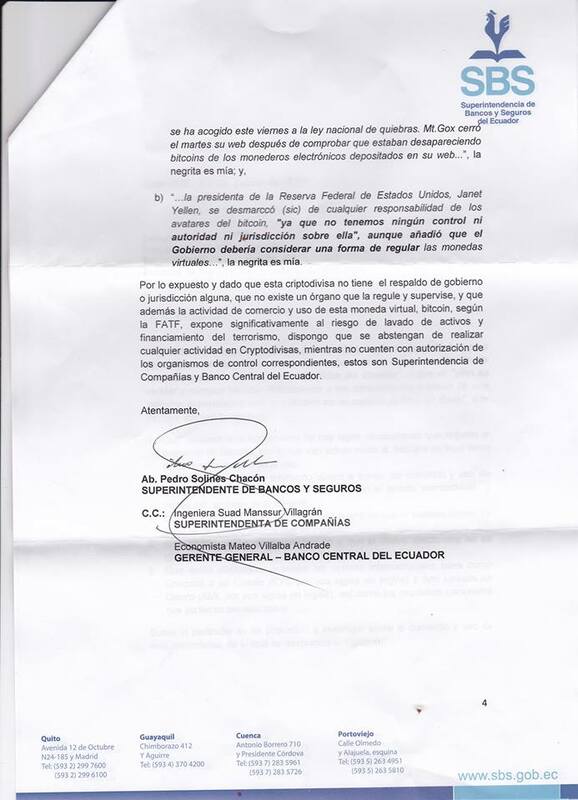 The Ecuadorian government responded weeks later, taking issue with the group’s enterprise and use of forbidden currency under the new code, and asked that they shut down. The group complains that their purchase of the ATM was not easy. “The process took about three months and involved [additional] costs of $1,300, including liquidation costs at Customs (AD-Valoren, FODINFA, IVA), registration with the BCE, and payments to FedEx,” they said. “In this regard, if an Ecuadorian citizen would like to invest in bitcoins or some other cryptocurrency, it would be a personal and individual decision and it would need to be done outside of Ecuadorian territory,” Andrade added. 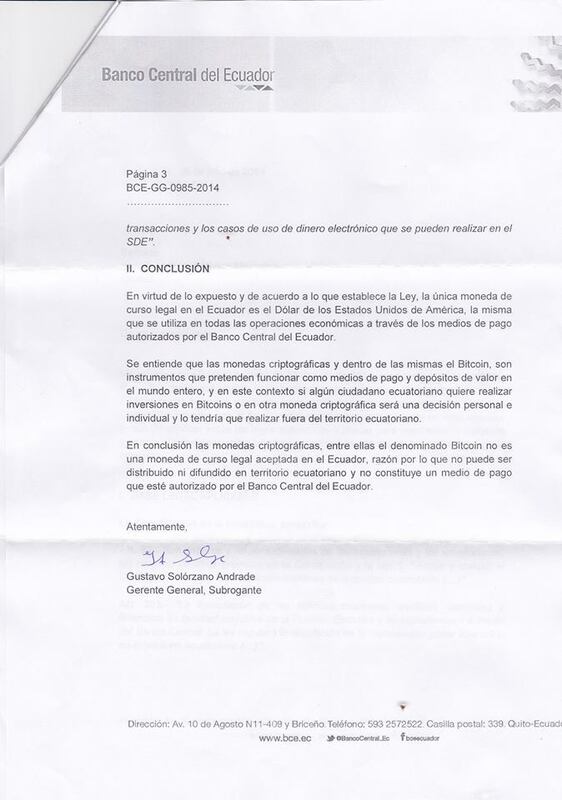 Meanwhile, the Superintendency of Banks and Insurance responded in a separate letter to the group’s request regarding the bitcoin ATM in Quito, Ecuador. The Santander bank and the Galicia bank, in its Argentinean subsidiaries, have closed two bank accounts belonging to Unisend, the first bitcoin exchange company in the country. The banks acted based on Article 792 of the Argentinean Commercial Code. Unisend issued a statement on Sunday explaining the company had not been informed of the reasons for the closures, and beginning on Monday, they would cease accepting any deposits or transfers to accounts belonging to these banks. The company says both of their accounts were shut down within five days of each other and that each closure notice was delivered by certified mail. Unisend also states that while they cannot receive any more deposits, those who wish to continue operating may do so through other means of payment (Easy Pay, Rapid Pay, etc.). The company also explained that deposits and withdrawals made in cryptocurrency are not disturbed in any way. On July 10, Argentina’s Financial Intelligence Unit (UIF) issued Resolution 300 ordering all financial institutions to report all transactions made with digital currencies, in an effort to prevent money laundering operations and the financing of terrorism. According to Article 4 of the resolution, currency exchange agencies, brokerage firms, banks, and other financial institutions must report all activity everyone month beginning August 1. Unisend is the only bitcoin exchange agency in Argentina that works with bank accounts.